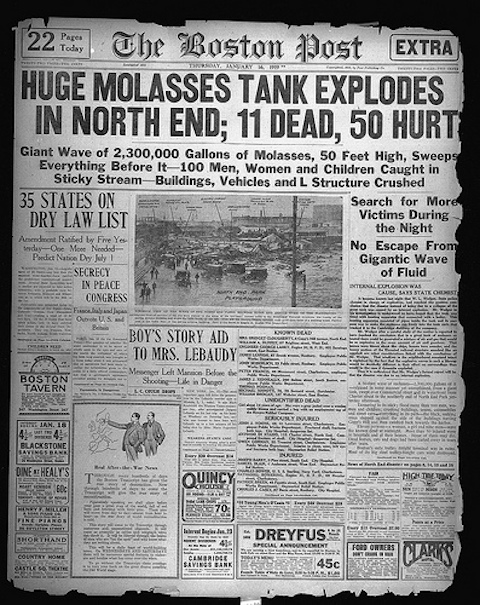 It fits perfectly into early 20th-century American lore, this all-too-real disaster: on January 15, 1919, a fifteen-foot wall of molasses rushed through Boston's North End, killing 21, injuring 150, doing $100 million in today's dollars worth of damage, and requiring 80,000 man-hours to clean up. Those figures come from a post on the subject at Mental Floss, which investigates what loosed the Great Molasses Flood in the first place. The United States Industrial Alcohol Company, owners of the brown, sticky substance in question and the exploding tank that contained it, pinned it on bomb-chuckers, claiming that, "since its alcohol was an ingredient in government munitions, anarchists must have sabotaged the tank." Investigations later revealed the cause as none other than seat-of-the-pants capitalistic hubris, another standby of early 20th-century America. The tank's "absurdly shoddy construction work," led by a man who "couldn't even read a blueprint," came down to this: they "threw up a gigantic tank as quickly and cheaply as possible, skimped on inspections and safety tests, and hoped for the best." 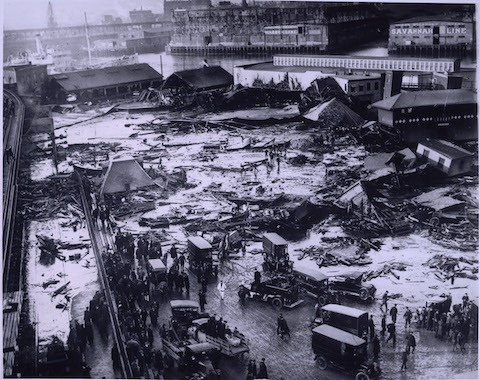 You can learn more about what happened in the video above, a dramatization of the events leading up to the Great Molasses Flood from the pilot episode of The Folklorist. The contemporary images above and below come from the Boston Public Library's Flickr set. 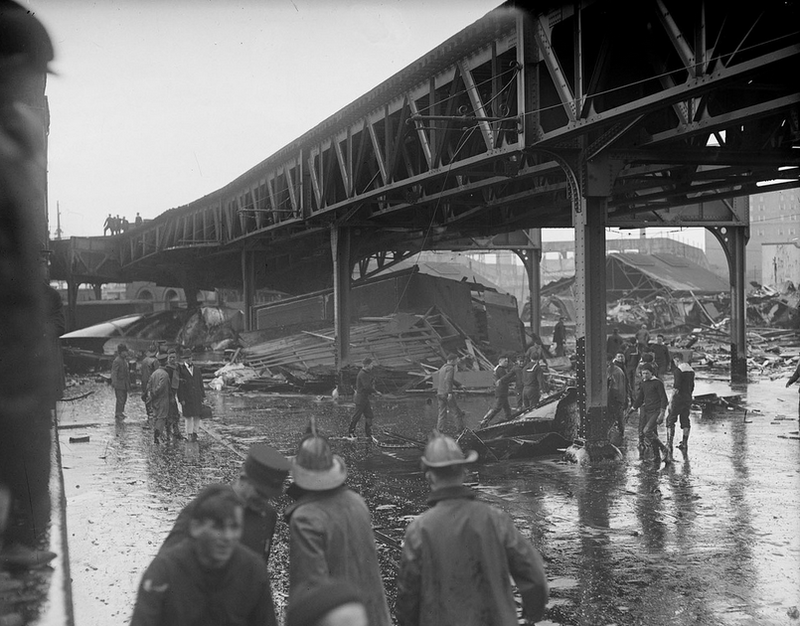 For the most definitive study of this gooey calamity, you'll want to seek out Dark Tide: The Great Boston Molasses Flood of 1919 by Stephen Puleo, who speaks in some detail about the event and its aftermath in this Real History video. All these well-documented facts aside, legend has it that, on a particularly hot day on Commercial Street, you can still smell the stuff.